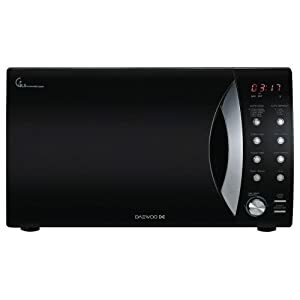 This is the best selling microwave oven on amazon.co.uk and once you take a look at the Daewoo KOR8A0R it is easy to see why. Not only does it look great with a modern and stylish black onyx finish and subtle LED display and easy to use buttons but it is packed with great features. This Daewoo microwave oven employs the use of a concave reflective system that ensures that your food is cooked quickly and evenly throughout avoiding the well-known issue with some cheaper microwaves that leave your food cooked on one half and cold on the other. The dual wave system found in the Daewoo KOR8A0R makes use of two microwave sources to ensure the whole of the oven is covered giving your food, no matter the size an even cooking. As well as being great at cooking the Daewoo is easy to clean thanks to its rustproof acrylic cavity and it comes with a child lock to prevent accidental operation of the microwave. If you are looking for a powerful and spacious microwave oven that is great value the 23 litre 800 watt Daewoo KOR8A0R is probably the best all rounder available to buy online today.